Here at DeckStainHelp.com, we have worked hard over the years to become your trusted reference for deck stain reviews and information. In 2017 PPG changed and transitioned the name of Sikkens branded products for exterior wood to PPG ProLuxe for North America. The PPG ProLuxe product line will contain all of the same Sikkens ProLuxe products and formulas, but will now showcase the updated PPG ProLuxe name and new packaging. PPG Proluxe (Sikkens) Cetol SRD (Siding Railings Deck) is a high solid 1 coat wood and decking stain. The SRD offers 3-way protection for your exterior wood. Protection from water damage, UV radiation, and Mold. 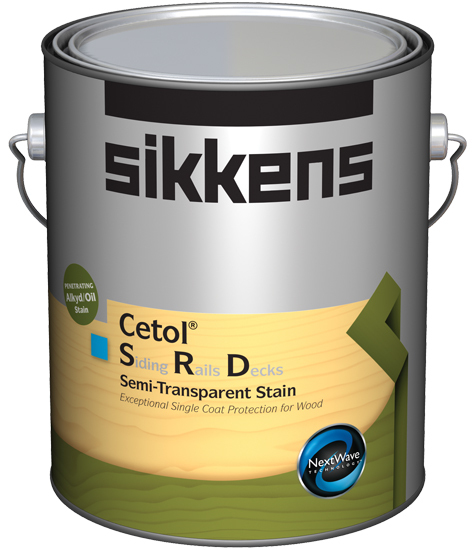 Sikkens SRD penetrates deep into the wood and does not film on top of the wood. 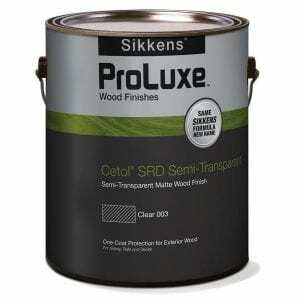 Containing Translucent Iron Oxide Pigments, PPG Proluxe (Sikkens) SRD can be used on all unfinished exterior wood. – The PPG Proluxe (Sikkens) SRD displayed a very nice natural cedar color to the pine dock. We were pleased with the penetration into the wood. Much better than other PPG Proluxe stains that filmed on top of the wood like a varnish. – At the 2 year mark, Sikkens PPG Proluxe Cetol SRD lost a lot of color after 24 months of full sun exposure. The stain that was left on the dock had either deteriorated away or darkened in color. – The Sikkens SRD exhibited bare spots on 30% of the flooring surface after 2 years. The dock exhibited a wear pattern down the middle of the walkway.